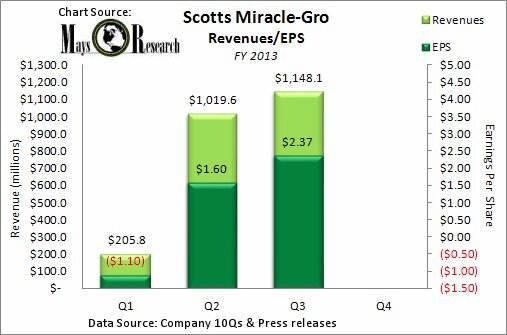 Scotts Miracle-Gro Soars in 2013, but Where Is the Retail Revenue Growth? 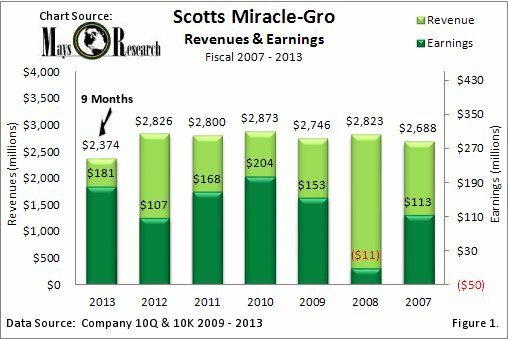 Scotts Miracle-Gro soared in 2013, rising just under 30%, much to shareholders' satisfaction. What is curious about the stock's mysterious growth spurt is that revenues have been flat since the company's fiscal 2008 while earnings have been erratic with no discernible pattern. Scotts Miracle-Gro (NYSE:SMG) has soared in 2013, rising just under 30%, much to shareholders' satisfaction. However, through the first nine months of the company's 2013 fiscal year, revenues are down 2.1% versus initial company estimates of 1%-3% growth in sales on flat volume. If they are unable to make up the deficit in their last quarter of the year, it will mark the third straight year the company has fallen short of its initial estimates. The company's revenues are closely tied to the fortunes of their downstream partners Home Depot (NYSE:HD), Lowe's (NYSE:LOW), and Wal-Mart (NYSE:WMT), which collectively account for roughly two-thirds of their annual revenues. What is curious about the stock's mysterious growth spurt is that revenues have been flat since 2008, while earnings have been erratic. The company's grass seed has sprouted more growth than company earnings have over the last six fiscal years. This year both Home Depot and Lowe's reported similar sales patterns in their respective outdoor product categories. Home Depot reported negative same store sales growth in their outdoor garden product group during the first quarter of their fiscal 2013, and followed that with double-digit same store sales growth in the following quarter. Lowe's reported a 7% decline in same store sales in its fiscal first quarter followed by 13% sales growth in its fiscal second quarter. Wal-Mart does not report specific outdoor living and horticulture sales numbers, which are a part of its home strategic merchandise unit. However, its home unit represented 7% of the company's total sales in its fiscal 2013, which ended on Jan. 31. Wal-Mart sales were 14.7% of Scott's Miracle-Gro revenues in its fiscal 2012. Home Depot is the company's largest customer, representing 32.2% of net sales in fiscal 2012, while Lowe's accounted for 18.4% of revenues. The persistent rains in early spring were the likely cause of outdoor revenues moving forward into the retailer's fiscal 2nd quarter, which overlaps Scott's 3rd quarter. There are two circumstances when homeowners are reluctant to work on their lawns: during periods of excessive moisture where muddy conditions keep you out of the yard, or a drought where no amount of seed or fertilizer will be beneficial without water. So what's the deal with the stock? Since the company announced its fiscal 2013 outlook on Dec. 14, 2012, this stock has soared more than 36%, outpacing the S&P 500 by more than 13% over the same period. The company estimated that sales would increase by 1%-3% in fiscal 2013. This is hardly enough news to send the stock soaring to new 52 week highs. More ideal weather may have created expectations that the company would exceed those initial modest estimates. A quick glance at figure 1 above shows that even a 1% to 3% increase in net sales would have exceeded the 0.83% actual average revenue increase between fiscal 2007 and 2012. The company has had a very poor record of meeting its revenue and earnings estimates since at least fiscal 2011. In fact, the company quietly revised net sales estimates for fiscal 2013 to between a -1% decline and an increase of 1% during its June presentation at William Blair's growth stock conference. Yes, a growth stock conference. 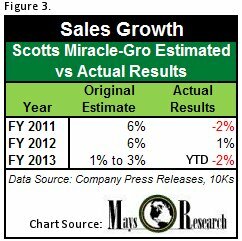 In my opinion, Scotts Miracle Gro will most likely miss its full earnings range of $2.50-$2.75 per share. Through the first three-quarters of fiscal 2013 earnings per share have been $2.87. The company typically posts a loss in its fiscal fourth quarter. Over the last 3 fiscal years 4th quarter, revenues have averaged $413.6 million, and losses per shares have averaged -0.77 per share. I expect full year earnings per share to come in below the low-end of the company's estimated range. At a recent closing price of $57.20, the stock is trading at about 18.8 times estimated earnings of $3.05 per share, which is lofty for a company with almost no revenue or earnings growth. However, there is a bright spot. The quarterly dividend of 0.44 per share has an annual yield of 3.1%, which is less than a 10-year but more than a five-year treasury. The dividend could offer some downside protection given the low-interest rate environment. However, the chance to cash in a nearly 30% year-to-date gain in a stock with no revenue and earnings growth just might be too good to pass up.